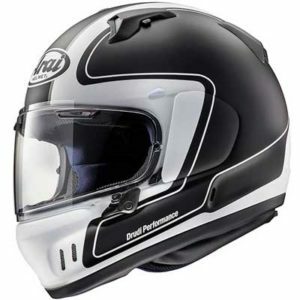 1 Looking to buy this Arai? 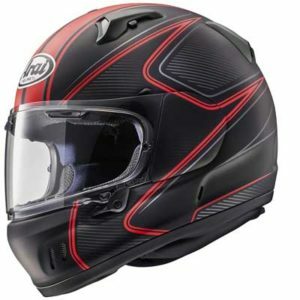 9 Best place to buy this Arai crash helmet? 15 Looking to buy this Arai? 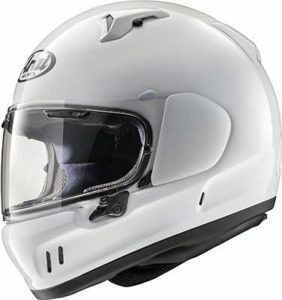 Arai’s fibreglass full face helmet designed for cruisers and naked bikes. Arai has made the Renegade V for riders of naked bikes – and specifically for riders of cruisers and cafe racers. It’s a fibreglass composite helmet that’s designed very much like the rest of the Arai family – which means it’s built to a very high standard and shares the overall helmet shape (R75) and many features with the rest of Arai’s current crop of high-end helmets. 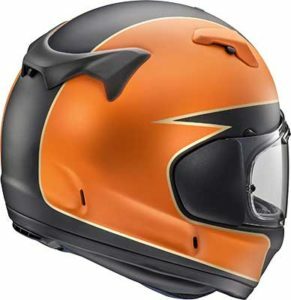 Only, the normally hyper-conservative Arai have added a few design flourishes to the outside of the Renegade V that makes it look a little more retro and ‘street’ than the rest of their helmet range. Whatever next?!? So, if you’re in the market for a new helmet for your naked bike, then read on to find out what you can expect from the Arai Renegade V (Arai Defiant X in the States). Looking to buy this Arai? 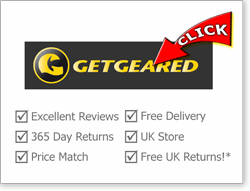 We recommend both SportsBikeShop (UK) and GetGeared (UK) for outstanding service, free helmet delivery (UK only) as well as 365 day returns. 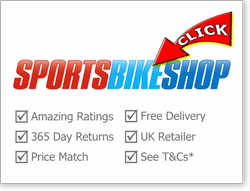 Please see here for more info on our recommended stores or click the links to go straight to their Arai helmets pages. The Renegade V is both ECE 22-05 and DOT certified. And while it’s not been SHARP tested in the UK yet, the US version has been Snell certified. All of which means it’s passed the pretty stringent European ECE testing regime and the Snell labs has put the US equivalent – the Defiant X – through an extra round of safety tests in the US where it passed their standards to get M2015 certified. 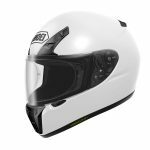 And with Arai’s recent improvement in scores in the SHARP safety test – with their last two helmets which use a similar tech and shape to the Renegade V, scoring a maximum 5 stars for safety – we’d expect the Arai Renegade to score pretty highly too. Like several other Arai helmets, the Renegade V shares the rounder R75 helmet shape that’s designed to ‘glance off’ objects during an accident. It also has their much vaunted peripheral banding tech where a strengthened band of fibre is wrapped around the helmet passing above the eye port to add strength and rigidity to the helmet. We’re not massively convinced it really helps make for a more protective helmet – in fact some argue that making a helmet too strong reduces its ability to absorb impacts, passing more shock through to the rider instead. But overall, we’d expect the shell of the Renegade V, coupled with the multi-density shock absorbing liner inside, to do its job admirably well. OK, onto other safety features. Well, there’s an anti-fog insert included in the box to keep the visor fog-free. A double-d ring fastener to keep it securely in place – and the helmet is produced in three shell sizes which is arguably great for safety as well as looks and fitting. I’d expect a premium helmet like the Renegade V to also maybe come with EQRS too – but overall we’d expect the Renegade V to give great protection when you need it. 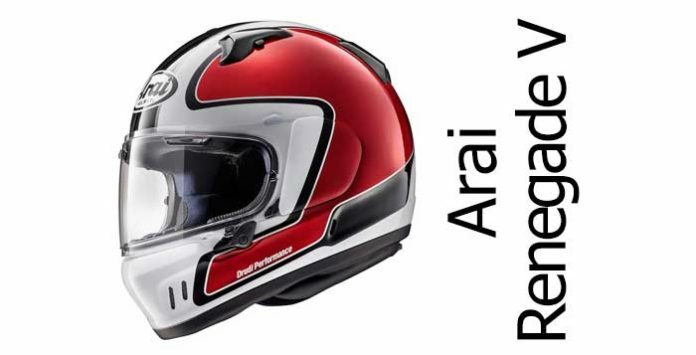 Arai helmets aren’t usually known for how quiet they are – especially the helmets designed for the track like the RX-7V. And with the Renegade V, Arai has put a few more vent holes into the helmet shell, all of which will let more noise in along with the air. To combat this, they’ve added what they call a noise-reducing foam to the cheek pads which they hope will keep things quiet. And they’ve also added a fixed chin curtain to the bottom of the helmet to keep noise out from below. It might have helped a bit, but overall, owners seem to reckon noise levels inside the Renegade V is about average for a full face helmet – so don’t think you’re going to be able to get away without using ear plugs with the Renegade because you won’t; not if you value your hearing that is! Arai’s made a big thing about the ventilation in the Renegade V. That’s because there’s a ton of vent holes all over the lid. Rear view of the black frost Renegade V showing side and to vents. First off, there’s those obvious four vent holes in the chin bar. They ventilate the chin and rear of the visor and while they look like straight-through old-style racing vents, they can actually be closed off from the inside of the helmet. Arai reckons that’s to keep the integrity of the helmet shell intact – so for safety. I’m not entirely sure how that squares up with the rest of their range which don’t have open holes in the chin guard… but anyway, owners reckon they’re a bit of a pain to use. They’re madly difficult to open/close on the move, especially as they both have to be found individually. So they really mean you’ve gotta stop, fiddle, then set off again. Not ideal. 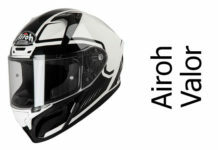 Like most other Arais, there’s a couple of vents in the visor ducting air into the helmet shell, as well as a pair of crown vents up top – and again these crown vents are both operated independently using small but glove-friendly sliders next to each vent. They do take time to get the hang of but once you do, they’re OK to find and open/close – though they are a bit more time consuming than using a single switch. New to the Renegade V, you’ll also find a couple of intake vents in the front of the cheek pads behind the visor. These are designed to draw air in from the face area and push it out of the side exhaust vents when you’re on the move. And talking of exhaust vents, the Renegade’s got seven rear exhausts (if you count the main 3-exit vent as three) including a rear neck roll exhaust. OK, that’s great. But do they work?? Easy to answer that one. Because owners reckon the ventilation is really great. The vent covers might be a bit fiddly to use, but if you want cooling then open them all up and the Renegade V will give gallons of the stuff (or should that be degrees?). Either way, it’s good. The visor on the Renegade V is designed to be larger than average to give both a larger vertical as well as horizontal opening. It also uses Arai’s VAS or variable axis visor system (designed to give a nice tight fit as well as allow Arai to lower the visor mechanism). While it does create an effective visor mechanism, it also means you get a slightly fiddly visor quick release mechanism that needs you to remove the side pods and perform a short masonic jig with the visor before it’ll pop off. Actually, it’s not too difficult once you do it a few times, but still it’s a bit more tricky than most other helmets around. Something else that can be fiddly is their visor lock/opening mechanism. If you’re used to Arai’s, you’ll be familiar with slamming the visor shut to find that it auto-locks. To unlock/open the visor, you need to push on the lock then push up on the visor tab. Again, a few new owners find this annoying and pointless – but you do get used to it over time. The Renegade V does come with a Pinlock Max Vision anti-fog insert in the box which is welcome and saves £30 or so (or adds £30 onto the overall price depending on how you look at it!). But, coupled with the visor ventilation system, it should mean your visor’s kept clear in all but the most cold/wet conditions. 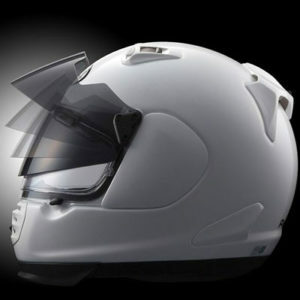 Arai’s pro shield system – as both a sun peak and visor tint. Arai don’t do internal sun visors. They reckon they compromise the safety of a helmet – though I’m not sure anyone else does, including helmet safety testing labs. They do offer their external pro shade tinted visor system as an extra though. Some folks love em, others loathe em. But if you want to have a sun shade system on your Arai and don’t like riding in shades or swapping out your clear visor for a tinted screen, then the pro shade system will set you back another £80-90. Not cheap! The Renegade V has a medium oval fitment – meaning it should fit most people’s heads that aren’t too round or two long and narrow. And while there’s no substitute for getting the right internal helmet shape to match your head shape in the first place, Arai’s internal comfort lining is probably the most out-of-the-box adjustable and customisable of any maker. It features removable 5mm panels to each side, to the crown and to each cheek pad which allows you remove or add padding to get the fitment just right. And if doing that doesn’t quite give you the fit you’re looking for, Arai does sell larger and smaller fitment cheek pads too. So, if you get the right fitting (see our helmet fitting guide) and tailor the fit with the comfort lining pads, then word is that the Renegade V is a really comfortable helmet. Combine that with some great ventilation and a lining material that’s ph neutral, anti-microbial and odour resistant – as well as created from a particularly soft and high quality lining – and the Renegade is a majorly comfortable place to stick your noggin. So that’s all good on comfort with several owners saying their Renegade is great for all day riding. In terms of overall appearance, the Renegade V looks pretty similar to most of the Arai range in that it shares the overall helmet shell shape and vent config of many other models. The most notable difference is the slightly sculpted chin bar with it’s four vent holes. Similarly, and as is usual with Arai helmets, most of the graphics are pretty conservative with a few classy graphic options available. To check the graphics out in more detail and see the latest Renegade V deals, feel free to click through to the Arai helmets pages on our recommended retailers below. 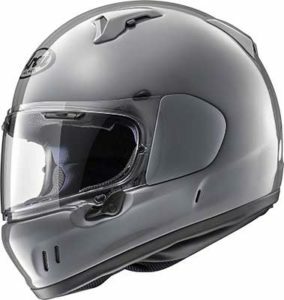 Best place to buy this Arai crash helmet? Please click below to visit the Arai helmets pages at our recommended stores (we research them and only recommend stores that score highly for quality of service). And if you buy from one, we get a small sum from the sale at no extra cost to you - a massive THANKS! (it's how we finance the site). Click above to drop onto their Arai helmets pages or *quick view retailer T&Cs here. Here’s a 3m video from Arai Europe taking you round some of the most notable features of the Renegade V.
The Renegade V comes with a good old fashioned double-d ring fastener. 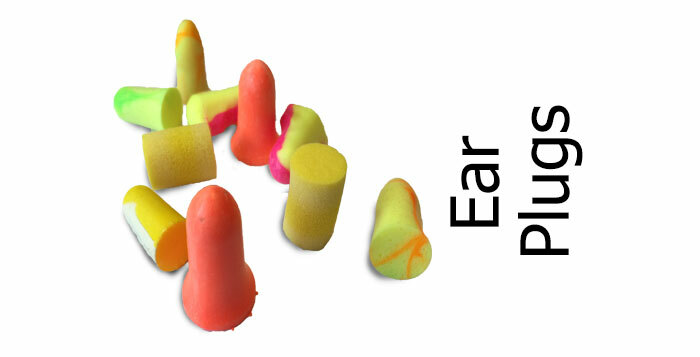 And if you’re looking to fit a bluetooth set, there are speaker pockets inside the comfort lining but there’s no word yet on how easy it is on the ears or easy to fit. As for build quality, it’s got Arai’s usual outstanding attention to detail and build quality so you should be able to ride without worry on that front. At 1.6Kg (3.5lbs) the Renegade V is slightly heavier than the average 1.5Kg full face helmet; though it’s doubtful it’ll cause any problems in practice – though click the link to find the lightest motorbike helmets if light weight’s a priority for you. Renegades come with a built in, permanent chin curtain to reduce noise and air flow from the bottom. And as usual, your Renegade will come with Arai’s 5 year warranty (7 years from date of manufacture found stamped or printed on the chin strap). Arai’s probably the most traditional of helmet manufacturers. And the Renegade V is only a slight development from many of their other helmets, using tried and tested helmet tech that’s proven to offer good protection in an impact (and much improving over recent years) and that’s popular with road riders and racers the world over. And of course there’s also that great Arai build quality and use of high quality materials that makes owning an Arai memorable. But then it should do because Arai helmets don’t come cheap. For that higher price tag, you could be forgiven for wanting a bit more of course. How about EQRS or how about a Pro Shade included in the box (or even better a photochromic visor) for example? And don’t forget, if you’re not used to an Arai helmet, you’ll have to get used to that quirky visor lock mechanism; plus the individual vent openers might get on your nerves a bit. But like the rest of its recently safety tested family of helmets, we’d expect the Renegade V to offer decent levels of protection and performance for most cruiser and naked riders. OK, if you’re after a more exclusive performance helmet, here’s a selection of helmets you might want to check out. 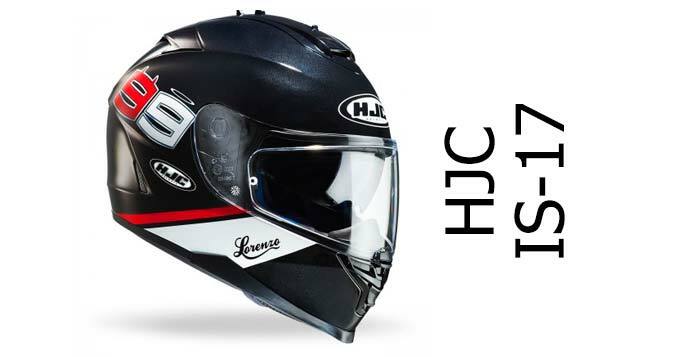 We’ve included both full face and modulars here – but only helmets that perform well in safety testing. 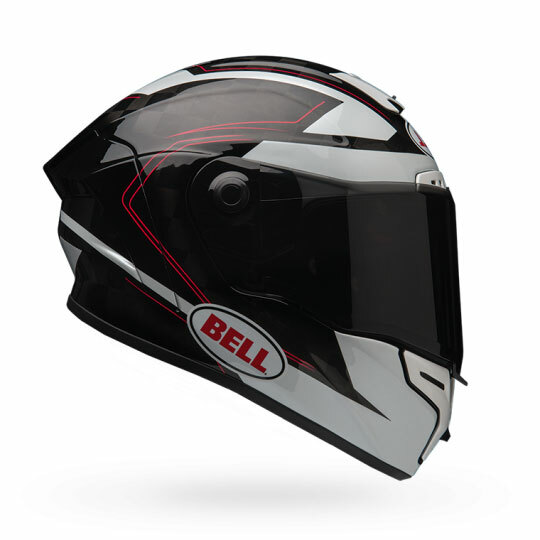 The Bell Star range are some fantastic sportsbike-oriented helmets that are SHARP 5 star safety rated. 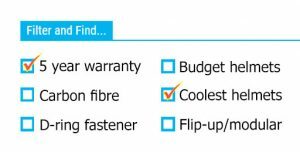 There’s also a variant to suit most budgets. 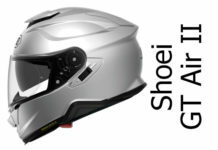 The Shoei RYD is a great all rounder full face helmet that, again, scored maximum marks for safety when SHARP tested it. 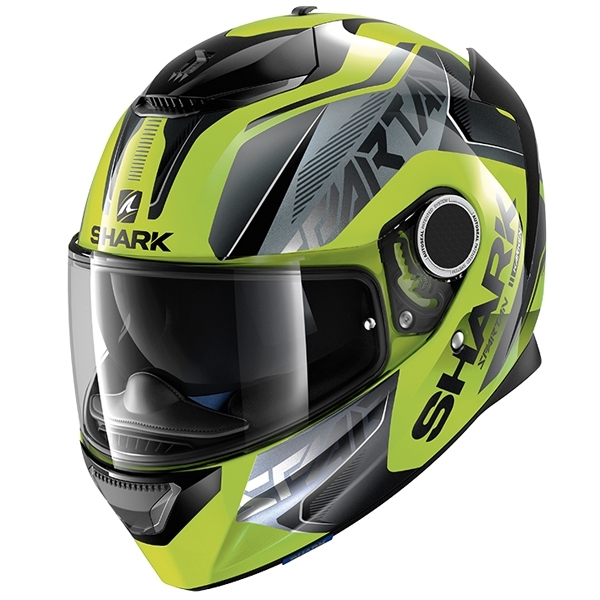 Or how about the lightweight carbon version of the Shark Spartan – a well rated full face road helmet with 5 year warranty and Pinlock in the box. 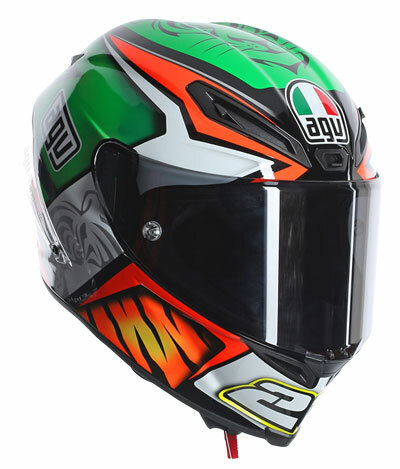 Or finally, there’s another sportsbike full face that scored maximum for safety – the AGV Corsa. It comes with a wide, optically correct visor and is a light weight carbon/fibreglass composite. 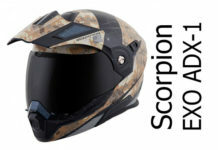 There are lots of alternative full face crash helmets. You can check out our Top 10 full-face crash helmets list to see our best rated helmets. 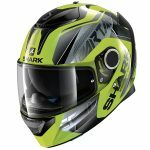 But we also recommend you take a look at all our full face crash helmet previews and reviews as well as our safest motorcycle helmets page where you'll only find helmets that are SHARP four or five star rated - so you'll know you're wearing the best protection out there. Arai Renegade V: designed for nakeds and cruisers and based on their safety-proven fibreglass composite helmet shell tech. It's got great ventilation, is about average for noise and while it's got an effective visor system, some owners reckon it's unnecessarily fiddly to use. 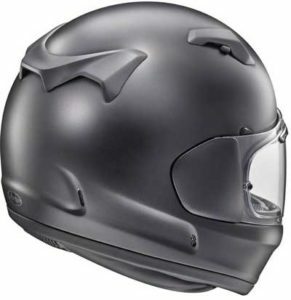 Having said that, it's comfortable and well built and all in all an effective full face helmet - but then it should be at this premium price.